Common “green” algae are microscopic, aquatic plant-like organisms and can be free-floating or wall clinging. Algae grow in salt or fresh water and thrive in temperatures above 85°F. In fact, it can “bloom” overnight. Algae spores constantly enter pool by rain, wind, animals, toys or swimsuits and left unchecked, can clog filters and create surface damage. 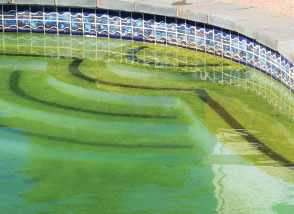 Use Banish® as it kills all types of swimming pool algae. 5. Brushing surfaces is vital!